SUMMARY: After the sudden death of her father (and one shameful indescretion with her best friend), 17-year old Lexi must travel from New York to Florida in an attempt to find her long-lost mother, who works in a circus. WHAT I LIKED: What's not to love about a traveling circus? The circus setting and carnival-esque atmosphere are among my favorite things about this book. You can almost hear the screams from the midway rides and taste that fluffy, pink cotton candy. Makes me want to run off to join the circus, too! The characters. I loved Lexi's self-deprecating, music-obsessed, creative, charming character. I loved the trapeze artist sisters, Liska and Lina, and how, rather than being the stereotypical mean girls I expected them to be, they befriended Lexi and made her feel like family. Though I was never crazy about Eli, I love how Lexi makes him work for what he wants and how she never has delusions about their relationship being the only possible relationship in her life. Lexi is a smart girl who keeps her romantic options open--really refreshing in today's contemporary YA. That Time I Joined the Circus is a fun adventure that kept me guessing right up to the end. Format. I really like how the chapters alternate between the present (at the circus) and a few months before (in New York). This is a unique way to bring the past and present together slowly, so the reader doesn't quite know exactly what happened before and after Lexi's father's death. Lexi feels guilt and shame over what happened in NY, and since the story is from her point of view, the slow reveal works well. Lexi doesn't want to think about what happened, so she unwraps it in her own time, as though she were admitting it to the reader when she is ready to deal with it. The music! Each chapter begins with a musical quote (mostly 80s punk rock). I am a child of the 80s, but I grew up listening to classic country--Merle, Hank, Willie, Johnny, Marty, and the like--so I knew only two of the songs (and neither was 80s punk). Still, the lyrics really went with what happened in each chapter and made me want to research the songs. And I am not the only one: Check out this YouTube playlist of videos of the 80s punk songs quoted at the beginning of each chapter. Love that! WHAT I DIDN'T LIKE: Curb appeal. The title and cover art are okay, and they do both encompass the story well enough. 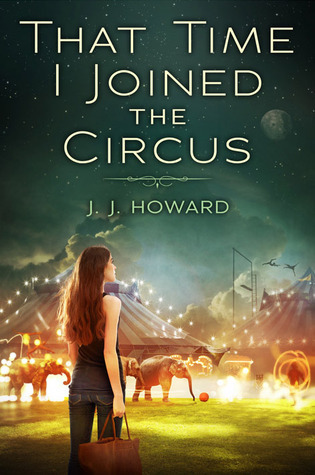 But considering the plethora of well-marketed, gorgeous cover art and titles available in today's YA fiction market, I just don't see That Time I Joined the Circus flying off my shelves. The "okay" packaging just does not do this book justice. I will talk it up with my students, so at least in my library, it will stand out for that reason. I just don't see it being popular without lots of booktalking. At the time I am writing this review, there is currently no book trailer for That Time I Joined the Circus. That would really help to generate a buzz for this cute little book that is so much better than it first appears. The flaky mother. I'm not going to say much here, but her excuses are supposed to evoke sympathy for her. For me, they still sounded like excuses from a woman who is playing the victim. Cue the violins. Nick. Lexi thinks she may love him? Why? She barely knows him. THE BOTTOM LINE: Thought the protagonists are high school seniors, this fun read is perfect for middle school girls. STATUS IN MY LIBRARY: Just bought it at our book fair. Sounds good. Isn't it amazing how much power a cover has?? ?